It’s the family photo that fills your eyes with tears of joy as well as tears of sorrow. 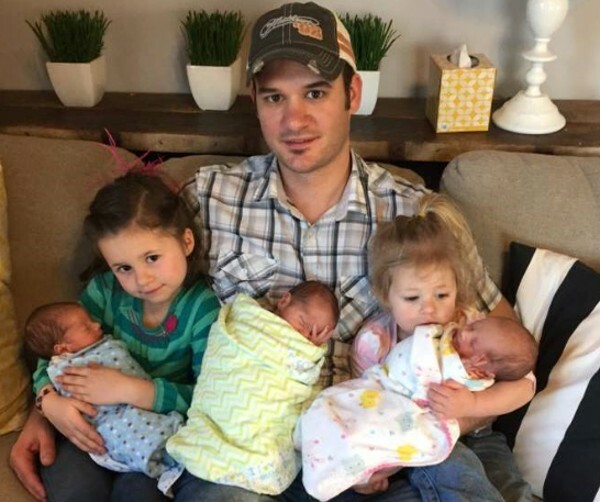 A proud dad, snuggling his daughters and newborn triplets, bravely keeping it together for the sake of his children. Holding them tightly, wishing their mother was here to share the special moment. 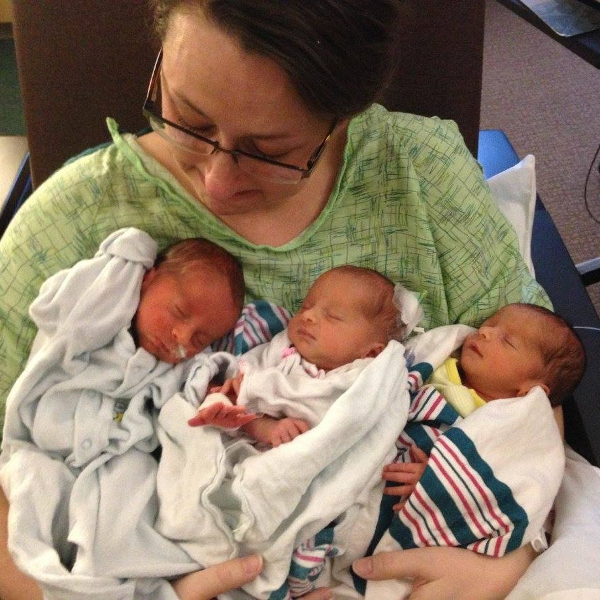 But Joey Rott’s wife Cassia died suddenly only 10 days after the birth of the triplets. The shock loss of his darling Casi – love of his life and mother of his children – has sent Joey from the peak of happiness after their babies’ safe arrival to the depths of despair. 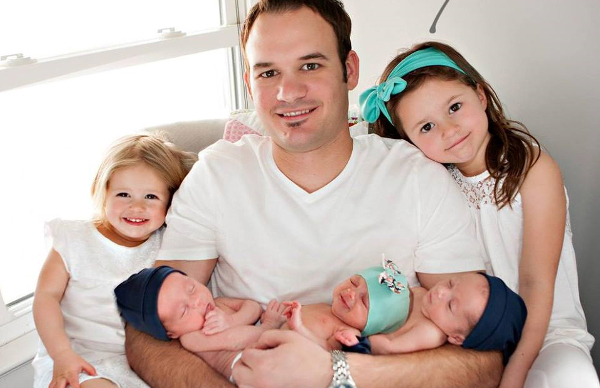 The triplets – Asher, Levi and Piper – were born on 29 January, 2016, in Kansas, joining sisters Tenley and Chloe to make a family of seven. Cassia was home from hospital within three days, but woke with a sore chest. It was discovered she had a blood clot in one of her lungs and she was given medication to treat it. 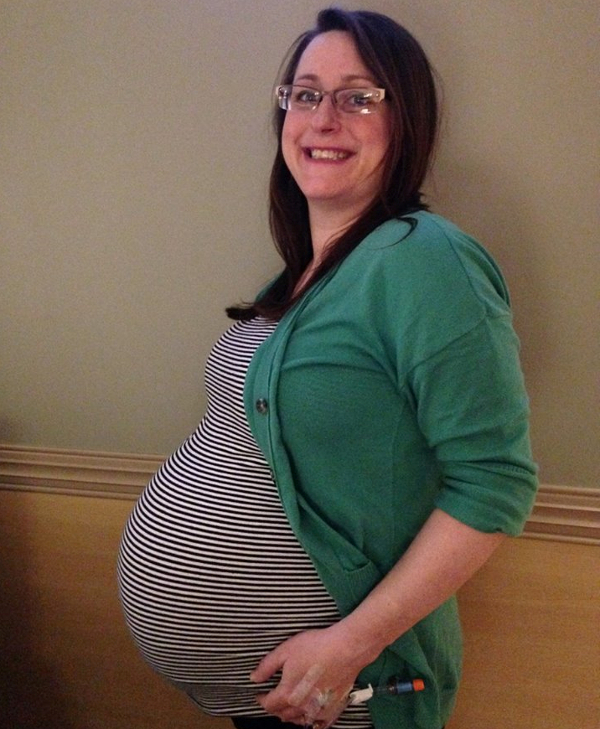 Then on February 8, with the triplets still in hospital and after surprising her oldest girls with a visit back home, Casi died unexpectedly. Joey now has to care for five children on his own at the same time as dealing with his own unimaginable grief. Loved ones and strangers have rallied, some starting a GoFundMe page to help the young family, raising an incredible US$147,000 in a month. The page’s creator, Hilary Holten Thompson, says the burden of finances and worrying about going back to work should not be an issue Joey needs to face quite yet. 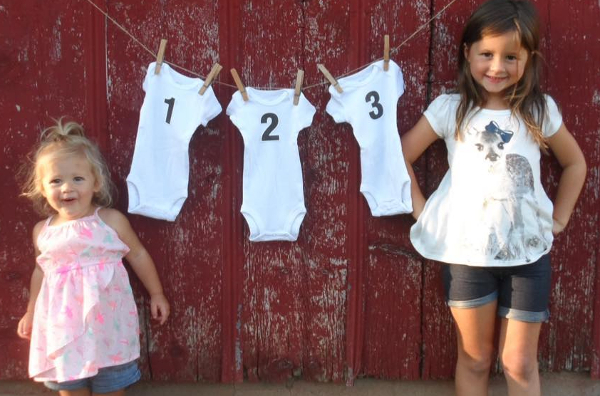 The triplets are healthy and now at home – too young to miss their mother like their dad and big sisters do. Joey created a Facebook page for the triplets and in memory of their mother. “I plan on adding more pictures and posts over time,” he says. “Sometime after Tenley was born, Casi told me: ‘if something ever happened to me, make sure our kids always knew just how much I loved them’. In this moving video, Joey talks about his family’s grief. Your heart breaks watching his strength and knowing what could have been for their beautiful family.